First2Host Review 2019: Is First2Host a Good Hosting? First2Host is a U.K.-based web hosting provider that caters to a worldwide customer base. Founded in 2003, they’ve gained a reputation for offering their users a more personal web hosting service than most providers in the industry. First2Host is a U.K.-based web hosting provider that caters to a worldwide customer base. They’ve been in operation since 2003, and have gained a reputation for offering their users a more personal web hosting service than most providers in the industry. With amazingly fast servers and a stunning uptime of 99.99% at a minimum, it’s no wonder that over 60% of their new customers are referrals from their existing clients. First2Host has four main categories of hosting services: SSD cPanel shared hosting, reseller hosting, VPS hosting, and dedicated servers. Their shared hosting and VPS packages are what they’re most known for, but their dedicated server offerings are very decent as well. First2Host’s shared hosting service employs 6Gbps SSD or NVMe hard drives to ensure the fastest media delivery speeds for your users. Among their many great features are their free website migration service, the Softaculous one-click app installer, free SSL certificates, and geographic IPs available in 14 locations to grant you better SEO rankings within your targeted region. Alternatively, if you need the best performance a shared server can muster, you can always opt for their NVMe Max plan – which gives you all the same features of the previous plan but runs up to 30% faster. One of the most impressive features of First2Host is that they offer a 99.99% uptime guarantee for their shared hosting service – and they report that their actual uptime has been 100% since 2015. This is nearly unheard of in the industry, especially since they also offer a free version of their SSD shared hosting plans. 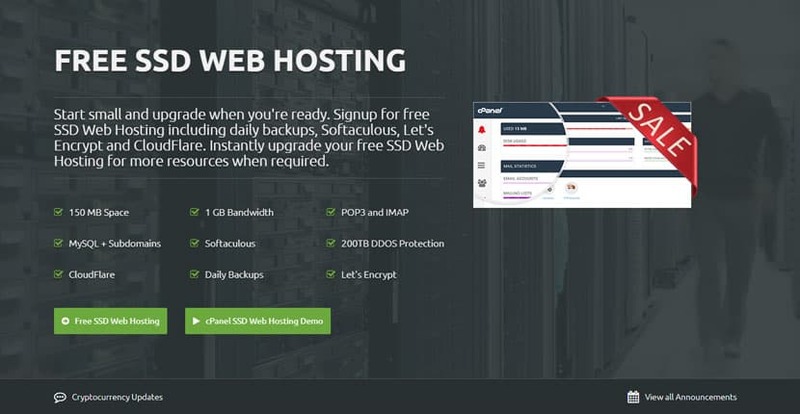 First2Host has a free fully-featured SSD cPanel shared hosting plan, so you can easily try their hosting service to see if they’re a good fit for you. From there, you can opt for their Basic, Mid, or NVMe Max packages, all of which are priced below market average considering the resources and features included. I daresay they might also have one of the cheapest VPS plans I’ve ever seen. It’s cheaper if you opt for their SATA hard drives rather than SSDs, but even with SSDs their VPS packages are more affordable than some of the shared hosting plans I’ve seen on the market. You can go for one of their pre-made packages, customize your own, or simply go for something basic and then easily upgrade your VPS servers later on through the client area. First2Host also has dedicated server packages which are priced around the market average. At one point, they did have some great offers on dedicated servers, but it’s unclear whether they’ll make those deals available again. First2Host is well known for their superior customer support, and for good reason. They’re always eager to help, and their technical support staff is extremely knowledgeable and efficient at resolving issues. During the week, they average a ticket response time of 15 minutes; alternatively, you can get a more immediate response via their live chat. When I submitted a ticket about a server issue on a working day, they had it all sorted out within five minutes. On weekends, they’re not as responsive, but they’re still available should any urgent issues arise. Few hosting providers can match the efficiency and affordable price range that First2Host offers. Particularly if you’re in need of easily scalable and highly affordable VPS hosting options, First2Host is well worth your consideration. Wondering how First2Host stacks up against other Web Hosting companies? Enter any other Web Hosting company and we will give you a side-by-side comparison.